What is the name of the cyclone that hit Odisha? International Day of girl child celebrated on 11th October. Theme for 2018 is With her: A skilled girl force. CRI INDEX - Commitment to reducing inequality. In World inequality index by oxfam 2018, which country topped the list. Out of 157 countries in India ranked 147. From Asia Japan leads with Rank -11.
Who took charge as MD and CEO of IDBI Bank? Rakesh Sharma he has replaced B Shriram. His term is for six month. The new Solicitor General of India is? Tushar Mehta. Before this he was additional Solicitor General. He will hold the office till June 30 2020. It became first Indian company in the service sector to get this award. Japan holds most powerful passport in the world according to 2018 Henley passport index. World Mental health day - 10 October. Theme of 2018 World Mental Health Day is young people and mental health in a changing world. Which country will host youth Olympic 2022? Innovation Centre between India and Israel opened at which place? Bengaluru. Objective of such innovation Centre is to bring together the companies of the two countries for joint venture in order to promote entrepreneurship etc. 13th Central information commission inaugurated by president Ram Nath kovind. Venue New Delhi. Important subject of this Convection balls data privacy, Right to Information, amendment in RTI act. Human capital index released by World Bank. Out of 157 countries India's rank was 115. The theme of humgan capital index 2018 " the changing nature of work. Coal India has signed Memorandum of understanding with Neyveli Lignite Corporation for 5000 megawatt power generation. Howrah Bridge 3000 megawatt would be solar powered by dress 2000 megawatt would be fossil fuel powered plant it is joint venture of 50-50 under the two Maharatna companies. Famous Malayalam poet MN paloor passed away. He received Sahitya Academy Award for Kathayillathavante Katha in 2013. He also won Kerala Sahitya Academy Award for highest literary honour in 1983. Medwatch is a mobile application launch to by? Medwatch is the first mobile health app among the three armed services of India. It was launched on occasion of 86 anniversary of Air Force. India's rank 103 of 119 countries. Belarus rank 1. The report is prepared by NGO named concern worldwide of Ireland and Welthungerhilfe (Germany). Which country secured highest number of vote in United Nations Human for its election? Headquarters Geneva. This is third time India has been selected to UN HRC. India has been selected for a period of 3 years from January1, 2019. World Health Arthritis day observed on 12th of October. The newly appointed chief executive officer and MD of Air Asia India is? The newly appointed chief statistician of India and secretary of statistic Ministry is? Which state has turned up as Partner Street for Goa International film festival 2018.? Jharkhand. The film festival will be held from 20th to 28th of November 2018. Ministry of skill and development and Entrepreneurship has launched scheme called "closing the skill gap task force" in India. What is official mascot for Odisha men's Hockey World Cup? Annapurna Devi recently passed away, with which field she was associated? Music. She passed away at age of 91 in Mumbai. World egg Day celebrated on 12th October. This was organised by department of animal husbandry dairying and fisheries. This will also enhance the Awareness of nutritional benefit of eggs. International Day for disaster reduction celebrated on 13th October. India's first cryptocurrency ATM setup in Bengaluru. Location - Kemp Fort Mall. Users can deposit money to buy cryptocurrency (bitcoin) by OTP received on number. To withdraw money, a request has to be made. Global competitiveness index 2018 ranking. Out of 140 countries. India jump 5 places and became 58 most competitive economy with score of 62. USA has a score of 85.6. India has highest growth rate in South Asian countries. In BRICS countries China topped with 28 position followed by Russia. Man Booker Prize winner 2018. Booker price is award given to the novelist write originally in English language which is published in UK. International Day for poverty eradication : 17th October. Muzaffarpur Shahi Litchi got G I tag (geographical indication tag). Recently Maharashtra Alphonso mango has also got G I tag. A total of 325 products from India are under GI tag. World food Day celebrated on 16th October. The Government of India launched Swasth Bharat Yatra on this day. On this occasion 7500 cyclist are expected to participate for 18000 km relay cycle over all the states to propagate the powerful message of Eat Right India. 12th Asia Europe meeting (ASEM) Summit held at which place? Brussels Belgium. It is today's submit with The Indian delegation was led by vice president I'm venkaiah Naidu. Theme Global partners for global challenges. Objective -sustainable development climate change terrorism Maritime security cybersecurity migration and investment. Recently which country has legalised recreational Cannabis? Canada. Now the canadians can grow for plant in their home and can keep up to 30 gram of bright cannabis for personal use. Prior to 2001 the use of Cannabis since 1923 was illegal in Canada. The first country to legalize was Uruguay. Who has been appointed as adviser for financial company (online) bankbazaar? SS Mundra (former RBI Deputy Governor). What is the name of Stephen Hawkins last book launched recently? India Japan joint military exercise Dharma Guardian to be held at which place? At which place the sixth UI India high-level joint Task Force meeting held? Mumbai, The basic objective of such joint task force is to achieve and explore the ways to facilitate investment in UAE and India industrial economic social sector to promote the economic growth of the two countries. This city has no be renamed as Prayag Raj? The Managing Director and CEO of ICICI Prudential Mutual Fund Nimesh Shah has replaced a Balasubramanyam. Prema Gopalan who is the founder of Swayam Shikshan prayog SSP and she received the award for promoting women's entrepreneurship from grassroot level and also in rural areas. This was a social entrepreneur of the Year award. This award was founded buy Jubilant Bhartiya foundation and Schwab Foundation in 2010. India International footwear organised at which place? Pragati Maidan, New Delhi. It was 6th edition of India International Silk fare and was inaugurated by Union Minister of textile Smriti Zubin Irani. Seoul Peace prize conferred  to Narendra Modi. The award was given for Narendra Modi's work in promoting world economic growth as well as that of India. the award was constituted by South Korea on the occasion of successful completion of 24th Olympic Games in 1990.
International atomic energy agency fusion conference organised at which place? Gandhinagar Gujarat. The conference will focus on development of new technologies related to nuclear fusion and physics. IAEA was established in 1957. Which company has launched PayPay mobile wallet in Japan. Paytm in collaboration with SoftBank and Yahoo Japan Corporation. United Nation day observed on 24th October what is the theme for 2018? The newly elected government in Bhutan will be headed by? According to Election Commission of Bhutan 71.46 voting was observed. Newly appointed MD and CEO of Paytm payment bank is Satish Kumar Gupta. Prior to this Renu Satti resign in July 2018. Scheme for promoting academic and Research collaboration launched by HRD Minister Prakash javadekar. the basic objective is to provide better research facility in higher education collaborating with 28 Nations. India signed 777 million dollar loan Agreement for Israel defence system. Bharat Electronics Limited has signed contract with Israel Aerospace industries for LRSAM. The distance system will be used by Navy ships. Joint military exercise between Pakistan and Russia was recently observed which is named as? World longest sea bridge opened in which country? China, the bridge is 55 km long which will connect Hong Kong, and Macau to the mainland of China with the city of Zhuhai. Steel used 400000 tons. The bridge will operate for 120 years which is tsunami and earthquake resistant. The only Indian company to be in the top 25 company among the world is Larsen and Toubro according to Forbes best employer category. Who among the following got carnot prize? Which district of India has won swachh Grameen award? Who among the following won Nobel Prize for medicine for contribution in in Cancer therapy buy inhibition of negative immune regulation? 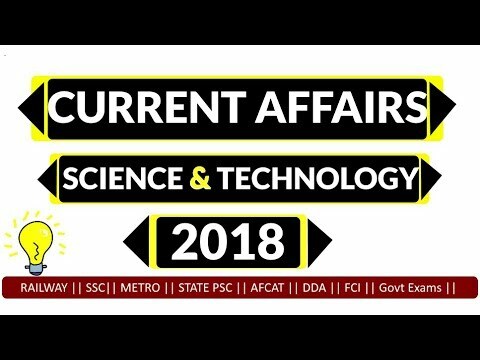 Which state of India has won future policy award? Who among the following did not get champions of the earth award 2018? who among the following got Social entrepreneurship award 2018? Who has been elected as chief economist at the International Monetary Fund? Newly elected Chief Justice of India is? Justice Ranjan Gogoi. He is 46th Chief Justice of India. Who has been appointed as Managing Director and CEO of ICICI Bank? The newly appointed India's Ambassador to China is? Vikram Mishri. He has replaced Gautam Bambawale. The newly elected chief executive officer of AirAsia India is? The venue of Asian para games 2018 is? The game will be held between 62 13th October 2018. Theme for 2018 - the inspiring spirit and energy of Asia.